Retractable coverage at the push of a button. Only ShadeFX retractable canopies cover large areas and protect you and your furniture from sun and rain. Adapts to all pergolas, arbors, trellises, and structures and installs easily by you or your contractor. Our revolutionary ‘Single Track Design’ allows for unparalleled coverage, ease of deployment and unrelenting protection from both the sun and rain. ShadeFX systems are engineered to operate without the need for a slope, providing a virtually flat installation. Our innovative solution facilitates even the most eclectic designs and tastes, while setting the new industry standard in outdoor space utility. As demonstrated below, our canopy assembly suspends from the single track, producing a peak which forces rain to run on either side of the canopy track. Diverse shapes, orientation, settings and locations. Only ShadeFX uses one drive beam located in the middle of the canopy to operate the mechanism. Since there is only one track, there is no need to align ‘tracks’. This allows ShadeFX to mount to frames of all types, including wood, without concern for jamming or binding as the frame may shift over time. Also, having the canopy supported in the center allows rain to shed to the sides. Although rain may pool it will not accumulate excessively. This makes ShadeFX the only retractable canopy system designed to be left out in the wind and rain that mounts to a frame of your design. ShadeFX retractable canopies are a fully framed canopy system when extended, with the strength to withstand most winds and even heavy rain. ShadeFX has canopy ‘wings’ that spread out from the drive beam support points unlike roll up awnings that rely on fabric tension for support between their front and back without support in between. For this reason, roll out awnings are not recommended to be left extended in the wind or the rain. Read the “ShadeFX Story” to learn more about the limitations of roll-retractable awnings that inspired the creation of ShadeFX Canopies. Whether you choose the drama of black, the passion of red, or the serenity of earth tones, color is the final statement that sets the mood for your outdoor living space. That’s why we offer a broad range of commercial awning fabrics. It’s all about choice and we will help you make the right choice. ShadeFX offers three types of quality fabrics with varying degrees of water protection. Depending on climate, usage and function, customers can choose between water resistant, water repellent and waterproof canopy fabrics. Below are some general guidelines on their application. If canopies are expected to keep an outdoor space dry for the duration of a light rain shower, water resistant fabrics will be suitable for your outdoor space. In climates that experience greater precipitation, water repellent fabrics may be a more viable solution. This type of fabric is tightly woven and/or coated with a chemical finish that repels water upon contact, rather then allowing it to seep through the material. If a canopy is subject to constant rain over a course of a week or an entire season, waterproof fabrics are recommended. Waterproof fabrics are not available in patterns, only solid colors, but will ensure a dry outdoor space regardless of precipitation. ShadeFX’s patented single track technology ensures that your canopy will extend and retract smoothly with no jamming or binding of its movement. The canopy can be stopped at any desired position from “fully extended” to “fully retracted”. ShadeFX retractable canopies are available in three drive options: manual, rope, and motor drive with remote control. Extend and retract the canopy at the push of a button. ShadeFX motor drive systems use food machinery components for the drive belt, bearings, pulleys and transmission for ultra durable and weather resistant operation. Extend and retract up to a single 24′ canopy at the push of a button. ShadeFX motor drives and controls are supplied by Somfy. Available control options include hand operated remotes, wall switches, and fully integrated home automation systems. Download Somfy brochure for more details. Extend and retract the canopy by pulling on a rope loop anchored to one of the pergola posts or to a wall, if convenient. 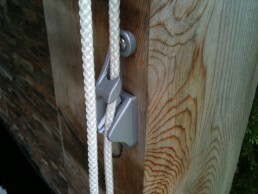 Lock the canopy in place anywhere along the track by fitting the rope into the retaining cleat. When fully extended or retracted, the rope that is in tension is the rope to fit into the retaining cleat. 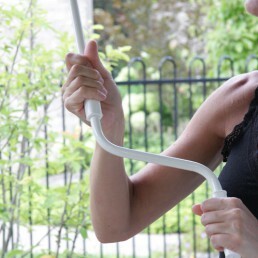 Extend and retract the canopy using a detachable crank handle. Turn the handle counterclockwise to unlock the canopy and pull it out as far as you want. Turn the handle clockwise to lock it in place. You can lock the canopy at any point along the track. The time and number of people required for an installation depends on a range of factors including size, structure material, method of operation, and more. However, regardless of size or mounting option, the fundamental simplicity of the system remains. For a complete guide to installing a ShadeFX underside canopies, download the installation guide for your desired drive option. We recently installed a 12 x 12 ShadeFX canopy, arched and motorized. I was very impressed with the quality of the product and the ease of installation. The installation went well and I found that it really does go up surprisingly fast. The awning is beautifully engineered and the installation deceptively simple. The pergola has so much more versatility in terms of when and how it can be used so there is much value added from a ShadeFX product. Just a quick note of our Shade FX awning. It looks great, provides lots of shade and installation was almost seamless. Thanks for your help and advice. We now have the nicest awning in town! The whole process went very smooth and once we settled on our design and authorized the canopy to go into production everything went as David described. We had no surprises the installation was very simple and we are extremely happy with the end result. I would recommend a Shade FX canopy to anyone looking to purchase a custom made retractable canopy for a pergola. The installation only took a few hours and it fit perfectly. I would recommend ShadeFX canopies personally and professionally to anyone.